We are having a casual hang out at the Culvers in Downers Grove on Saturday September 18th. This is a great chance to hang out, show off your car and enjoy some butterburgers and/or custard. WHAT: Culvers hangout. They have a very large parking area, perfect for showing off our cars!! WHO: This is open to all Chicago MINI Motoring Club members or anyone interested in the club. WHY: Just a great chance to socialize, show off your MINI or Mini and enjoy some food. We’re going to New Glarus Saturday morning, but if we make it back in time, we’ll be there. I’ll miss this one most likely as that is Windy City BMW VintageFest day and I may not make it out of Vernon Hills/Mundelein. Have fun with the Butter Burgers and cheese curds! sorry wish we could ……….oh so close to our house we will be in indianapolis that weekend for monster truck racing and mud bogs at the state fair grounds. 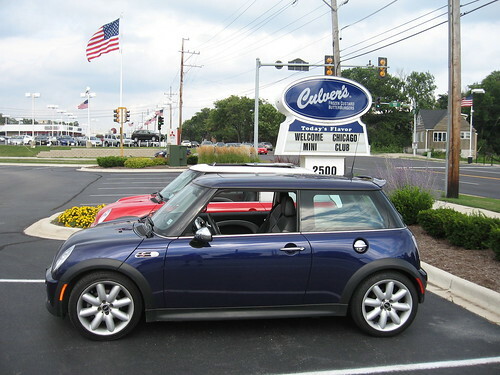 We’re always up for a trip to Culvers. Alex, Jule, and I will be there! Where in Chicago is the Windy City BMW Vintage Fest? It’s a ZF Industries in Vernon Hills. You can stop by to visit without preregistering. Should be over 80 cars on display, including many 2002’s. Last year there were quite a number of other interesting cars including two Z8’s and there normally is at least one M1. Thanks everyone for attending.. It was great to see old friends and meet all the new people! !